E. A. Hornel (1864–1933) depicted Galloway girls in decorative, idyllic natural settings. From 1900 he also designed a small Japanese garden at Broughton House in the Borders town of Kirkcudbright. 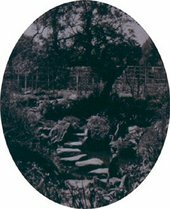 Hornel's garden combines standard features of Japonaiserie with a few symbols of ‘Scottishness’ – local stones and relics. So how might we interpret references to idealised Japanese and Scottish aesthetic and cultural traditions in both paintings and garden? From the 1900s through to the 1920s, the Scots painter Edward Atkinson Hornel (1864–1933) turned increasingly to the cultivation of his antiquarian collection of local literature; folklore, poetry and history; and his walled garden by the banks of the river Dee in the Scottish Border town of Kirkcudbright. Hornel’s one acre garden was designed in sections (some were already in existence): areas of lawn, rose-beds and box hedges, flower and herb gardens (fig.1). 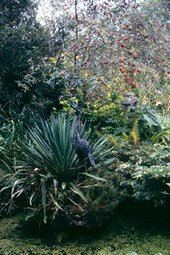 But the section deemed most important to the artist himself was, as Stephen Harvey writing for Scottish Field in the 1970s termed it, ‘An Eastern Garden. This was clearly the artist’s own dominion, a place apart from the conventional villa garden, landscaped with exotics to remind Hornel of his travels. It was planted with pink Japanese wind flowers, with flagged paths meandering between clumps of golden maple, Japanese dwarf pines, a lily pond with stepping stones watched over by a lead flamingo, a grove of flowering cherry trees, a magnolia’1 (fig.2). All of these derive from mid to late nineteenth-century japonaiserie, but around that collection of oriental plants and accessories, such as stone lanterns, were gathered relics of local origin; meal querns, curling stones, a tiny stone trough (actually an ancient coffin for a young child), an eleventh- or twelfth-century wayside cross from nearby Dalshangan village and a collection of stones, some decorative or inscribed, purloined from the ruins of nearby Dundrennan Abbey (figs.3 and 4). This favoured section of the garden, this place apart, is in one sense bricolage: objects appropriated, removed, relocated and assigned new meanings. So how might we interpret this ‘Japanese-Scottish’ garden? How might we understand the interrelations here between forms of painting, print-making, illustration and garden design, and what relation might these have to issues of cultural and national identity? A native of Kirkcudbright,2 Hornel began work on his garden shortly after his purchase in 1901 of the rather grand eighteenth-century Broughton House on the High Street (fig.5). Having grown up in that street in more modest accommodation, he acquired ‘Bro-Hoose’ at the peak of his professional career. My contention here is that the aesthetic principles and cultural preoccupations that informed the design of his garden, extend those of his artistic practice from the late 1880s. As, from 1901, his paintings declined steadily into repetition and cliché and were no longer a focus for his originality, real stimulus came from the creation of an alternative space – the artist’s garden which we might regard as the material embodiment of an imagined arcadia over which he could exert his omnipotence and cultivate his memories. In acquiring and arranging his plant specimens, just as he accumulated and extended his collection of rare books, the artist projected his ideal identity, his cultural and aesthetic preferences. 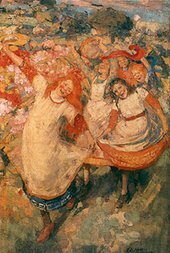 Hornel’s paintings celebrated a Galloway that was magic and exotic, a disposition that was widely shared by the close of the nineteenth century. His own fascination for the local folklore was first revealed in his illustrations to Malcolm Harper’s Bards of Galloway of 1889, a collection of the legend and poetry of a region deemed well fitted to the ‘poet’s eye and heart’, with its ‘poetic superstitions’, ‘picturesque glens’ ‘and the venerable relics of antiquity with which its villages are studded’.8 But Harper’s closing lament is very familiar: ‘cheap literature, railways, telegraphs, the bustle and hurry of commerce, a refinement of life and manners, all mean that the old customs of the country are fast disappearing’. Fairies are no longer believed in and ‘the romance has disappeared’. The ‘essence’ of place and character lies in the past. Glasgow Museums: Art Gallery and Museum, Kelvingrove. Hornel’s exposure to aesthetic doctrines like these ultimately shaped his aesthetic geography. His conceptions of Galloway, like Sérusier’s of Brittany and Van Gogh’s of Provence are analogous to idealised western views of Japan. In February 1893 he and Henry, funded by Reid, set sail for Japan. But Hornel’s perceptions and prejudices – later revealed in his lecture to a Glasgow audience – oscillated between rapture and regret. He remembers the country as a lotus land, its people ‘as a large and happy family, clattering along in the sunshine with smiling faces to spend the day ‘mid plum or cherry blossom’. Yet ‘the revolution of 1668’, he declared, ‘swept away for ever the old Japan with its poetry and romance, investing the country with the habits and practices of Birmingham’.17 In common with other artist visitors such as Mortimer Menpes and Alfred East, he appreciated the Japanese reverence for nature (‘Nature to them is symbolism itself’) and their festival times (‘the whole earth [rejoices] in a profusion of bloom’) but what emerged most powerfully from this account was an obsession with good and bad taste, with charm and vulgarity – the charm and perfect taste displayed in Japanese flower arranging, the vulgarity and bad taste of the West. Hornel hankered after the ‘highest ideals of the Feudal Jap of old time’, for the present day merchant classes are ‘liars and untrustworthy’. This class and cultural snobbery extended to his perceptions of Japanese gardens. He admired the ‘gardens of the wealthy and upper classes where miniature lakes and waterfalls with quaint bridges, tiny landscapes with dwarf pines and shrubs relieved with stone lanterns, take you into fairyland’. 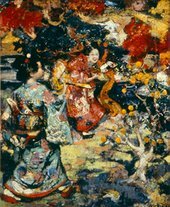 Hornel’s first thirteen-month trip to Japan (he went back in the 1920s) was an exercise in pursuing scenes of picturesque authenticity and avoiding or editing out the aesthetically undesirable – evidence of Japanese modernity. For the most part, as Bill Smith records, the artists remained in the area around the treaty ports of Tokyo and Yokohama, sketching in parks and tea gardens that were later used in compositions like A Japanese Garden, 1894 (fig.11). Ayako Ono has demonstrated the extent to which these compositions were closely reliant on albums of hand-tinted prints created specifically for tourists, depicting geishas in tea ceremonies, dancing or posing in gardens amongst the chrysanthemums.21 As with earlier Galloway compositions, the artist here mingles certain elements of the Japanese print, a use of perspective in particular, with much denser brushwork, brilliant colour and a more intense, all-over decorative quality still derived from Monticelli. Although his pictures draw inspiration from a supposedly Japanese attitude to nature, they share little of a formal, compositional approach. All of the national and cultural stereotypes considered so far – of Scottish art as innately decorative and unworldly, of the Japanese artist in an essential harmony with nature and of a Pan-Celticism (intuitive, romantic, spiritual) that extended beyond Scotland to a special identification with Pont Aven synthetistes – culminate in interesting ways in the Scots naturalist and city planner Patrick Geddes’s short-lived journal The Evergreen published in Edinburgh between 1895–6.25 This contained illustrations of Breton subjects by the Scots artist Robert Brough, of Celtic heroines and heroes by the Scots symbolist John Duncan, of dancing girls in gardens and natural landscapes by Charles Mackie, who also designed the ‘Tree of Life’ cover for the journal. Hornel himself made an appearance in the second issue, The Book of Autumn, in 1895, with a line drawing of a Japanese geisha gazing across an ornamental garden (fig.12) Its title, Madame Chrysanthème, refers to Pierre Loti’s influential novel of 1888, which did much to inform the view of European artists like Van Gogh of Japan as a simple, organic, primitive country. Hornel’s Japanese lecture had described the rhythm of the seasons there, of flowers after flowers, all culminating in the ‘regal and imperial chrysanthemum’, emphasising (as did Geddes) the fundamental importance of the cycle of nature. For Geddes himself, in that same issue, ‘the seasons determine labour, the family and the very structure of society, posing a problem for the ‘modern Troglodytes’ in their ‘smoky labyrinths’ in the city. The intuitive artist’s role in all of this is simply to perfect his ‘fantasias of reveries’. ‘Our new Merlins’, he wrote, ‘thus brighten our winter with their gardens of dream.’ In the artist’s perception of the progress of the seasons – from the seasonal decay of rotting compost to the growing seed of a new life – lay the regeneration of the ‘Individual and of the Race’. In his biological mysticism Geddes was continually intent on a unity of art and science, of which gardening was a prime example. ‘Il faut cultiver son jardin’ he declares – inevitably, perhaps.26 This was exactly what Hornel was poised to do. Shortly after the success of his Japanese exhibition, Hornel reverted to depictions of Galloway children in nature, for example, In the Orchard (City Art Gallery, Edinburgh) or Tate’s Autumn, 1904 (fig.13). However, he maintained the same picturesque low viewpoints and animated surfaces that intertwine the local girls within the blossoming orchard and garden scenery. 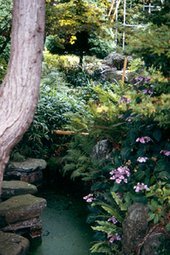 The physical space his Japanese garden occupied is small and densely planted with, as a result, a claustrophobic quality. There is no possibility here of a bird’s eye view or a commanding perspective. To stand back is to risk falling into the lily pond or the stream (fig.14). The experience of actually being in the garden, surrounded by dense foliage, is rather like that of looking at one of Hornel’s low perspective paintings of garden motifs. The only missing ingredient in this magical, self-sufficient world is that self-absorbed group of young girls. And that eschewal of distance in the painting, matches the artist’s own growing absorption in his local social space, increasingly divorced from the wider art world. From this point Hornel photographed his models in the specially designed studio at Broughton House, later filling in the backgrounds with studies of foliage from the garden or settings from local woodland or nearby Brighouse Bay. His palette became steadily less vibrant and the works have little of the rhythmic vitality of those from the late 1880s and 1890s. As the relationship with Alexander Reid came to an end around 1909, Hornel devoted more attention to his house and garden and increasingly became a leading, paternalist figure about the town. So when E. Rimbault Dibdin came to Kirkcudbright to write about Hornel’s ‘Paintings of Children and Flowers’ for The Studio in 1907, he described first the artist’s ‘fine old house’, ‘set in a large old garden’, and noticed that, ‘All about his doors are the children of the poor, [many his red-headed young models]. His garden is full of flowers, and the flowers of humanity are free to come in from the street [through the side gate] and enjoy themselves in it. He meanwhile studies and paints them, the flowers and the children, in the open air’.27 Geddes’s Merlin perhaps in his garden of dream? The ‘impression of fantastic unreality’, Conder argued, which Japanese garden designs produced on the minds of Westerners was the result of the refusal of naturalism, also found in Japanese art. In both landscape painting and garden design, nature was represented, not reproduced. Leading characteristics were selected and accentuated so as to combine ‘a mood of nature and also a mood of man’. A garden should be designed ‘to suggest a suitable idea and arouse definite pleasurable associations’, the ideal Japanese garden being, therefore, ‘a retreat for secluded ease and meditation’. On his return, as Smith records, Hornel showed annually at Royal Academy exhibitions, pictures which had become increasingly mechanical and repetitious, often just reversing images from other paintings.33But steady financial rewards were enough to allow him to concentrate on house and garden. In 1916 the still new journal Scottish Country Life (which first appeared in 1914) visited Broughton House (fig.15), noting the old world picturesque atmosphere of the town and its ancient history. The entrancing ‘old world garden’ behind Hornel’s house reminded the author of Herrick’s bewitching ‘wild civility’, and he or she felt moved as ‘with the insistence of an old melody‘.34 Such a location was perfect material for that journal: it was ‘a treasury of art, impeccable taste, and irresistible effects; the external efflorescence of the soul of the painter whose joyous creations have profoundly enlarged the aesthetic vision of the race’. All of this was clearly aimed at a readership much concerned with matters of historic, Scottish tradition, with the cultivation of taste, with issues of preservation and conservation and drawn to nostalgic representations of historical harmony. These, essentially, were Hornel’s own concerns. His collecting mania was accelerating as he acquired, in 1919, local publisher Thomas Fraser’s own library of books on Borders’ history and folklore to add to his own. At this point he apparently envisaged creating an art gallery and library alongside his garden to hand down to the local people of Kirkcudbright.35 But at the same time he continued his infatuation with Japan, still intent on recreating the impact of that first visit, still seeking enchantment and sensual gratification, and perhaps hoping to rekindle the vitality quite lost from his paintings. So he travelled via Burma to Japan again for six months in 1920 and painted gardens mostly in Kyoto, which he used as backgrounds in pictures, having been given a ‘gorgeous book’, as a memento and taken on a tour of the best local gardens by the son of Marquis Matsukata. Nostalgia and memory became central themes of Hornel’s late work: indeed, Memories of Mandelay is the title of a large work still hanging inside Broughton House. For a visitor named Dorothy Burnie in 1925, the importance of memory, the transience of summer and of life was expressed metaphorically outside the house, too – in the garden, in the form of three old sundials ‘silent reminders of Time’. For Burnie, the house itself contained an unrivalled collection of the history and literature, the ‘folk-lore and romance of the storied land of Galloway’: it was ‘the veriest poem of art in nature‘.36 Such had been the ambition of the artist in his paintings, but it was perhaps outside, in his garden, that he was best able to create an ideal space, an ideal identity and cultural landscape. 1. Stephen Harvey, ‘An Eastern Garden’, Scottish Field, March 1977, p.24. For recent newspaper description see also David Stuart, ‘East Meets West in Galloway’, The Scotsman, 8 August 1999. 2. Originally from Kirkcudbright, Hornel’s family (his father was a bootmaker) emigrated to Australia in 1856, where Edward was born in 1864. The family returned to Kirkcudbright in 1866. 3. Hornel’s career is described in most detail by Bill Smith, The Life and Work of Edward Atkinson Hornel, Atelier Books, Edinburgh 1997. See also discussion of Hornel in Patrick Bourne, Kirkcudbright, 100 Kirkcudbright, 100 Years of an Artist’s Colony, Atelier Books, Edinburgh, 2000. On the activities of Reid as dealer, see Frances Fowle, Alexander Reid, unpublished thesis, 1993 and for more reference to George Henry, see Roger Billcliffe, The Glasgow Boys, 1985. 4. For discussion of Sargent’s painting see Kenneth McConkey, Impressionism in Britain, exhibition catalogue, Yale University Press and Barbican Art Gallery, London, 1995, pp.43–4. 5. Marion Hepworth Dixon, ‘Monticelli’, The Art Journal, 1895, p.212. 6. On Hornel’s exposure to Monticelli in Scotland, see Bill Smith 1997, pp.41–2. 7. For similar reading of space within the depiction of idyllic, enclosed landscapes, see Sam Smiles, ‘Samuel Palmer and the Pastoral Inheritance’, Landscape Research, Winter 1986, pp.11–15. 8. The Bards of Galloway: A Collection of Poems, Songs, Ballads etc by Natives of Galloway, ed. and intro. Malcolm McL. Harper, Thomas Fraser, Dalbeattie, 1889, p.vi. 9. 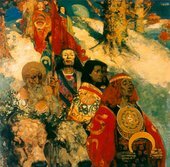 The Druids received positive reviews when it was shown at the Grosvenor Gallery in London in 1890. 10. John Morrison, ‘Nationalism and Nationhood: Late Nineteenth-Century Painting in Scotland’, in M. Faco and S.L. Hirsch eds., Art, Culture and National Identity in Fin de Siècle Europe, Cambridge University Press, Cambridge, 2003, pp.195–8. 11. See Lindsay Errington, ‘Celtic elements in Scottish art at the turn of the century’, in John Christian, ed, The Last Romantics, the Romantic Tradition in British Art from Burne Jones to Stanley Spencer, Barbican Art Gallery and Lund Humphries, London, 1989. 12. Mackie may have kept Hornel informed of developments in Pont Aven and, As Bill Smith (1997, p.56) records, Mackie met Gauguin in Paris in 1891. 13. ‘Concarneau as a Sketching Ground’, The Studio, vol.24, 1895, p.180. 14. Malcolm Chapman, The Celts: The Construction of a Myth, Macmillan Press, London, 1992, p.228. 15. MacColl’s Spectator review of the Henry and Hornel’s at the Liverpool exhibition in 1892. 17. Hornel’s 1895 lecture, ‘Japan’, Corporation Art Galleries, Glasgow, 9 February 1895 (transcript from Broughton House). 19. Japan, A Record in Colour, Mortimer Menpes, Adam and Charles Black, first edition 1901 (this edition 1905), pp.77–9. 21. 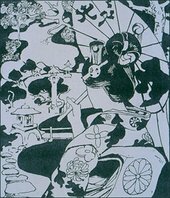 Ayako Ono, Japonisme in Britain: Whistler, Menpes, Henry, Hornel and Nineteenth-century Japan, Routledge, London, 2003. 22. Glasgow .’ indecipherable hand written record in Broughton House, dated April 1895. 23. James Caw, Scottish Art, Past and Present 1620-1908, (first published 1908), Kingsmead Reprints, Bath, 1990, p.401. 24. Richard Muther, The History of Modern Painting, Henry and Co., London, 1896, p.699. 25. For extremely interesting recent essays see Frances Fowle, Belinda Thomson, Murdo Macdonald, et.al, Patrick Geddes: The French Connection, White Cockade Publishing in assoc. with the Scottish Society for Art History, Oxford, 2004. 26. Patrick Geddes, ‘The Sociology of Autumn’, in The Evergreen, The Book of Autumn, 1895 part II, pp.31–8. 27. E. Rimbault Dibdin, The Studio, XLI, June 1907, pp.3–9. 28. Josiah Condor, Landscape Gardening in Japan, first published 1892 (but a 1912 supplement), this edition, Kodansha International, 2002, intro by Azby Brown, pp.8–9. 30. The Times, 28 May 1910, p.10. 31. ‘Dundrennan Abbey – A Personal Tour’, see freespace.virgin.net/richard.wordsmith/duntour.htm. 32. Letter in archive at Broughton House, also cited in Bill Smith 1997, pp.115–16. 34. Jas. Shaw Simpson, Scottish Country Life, June 1916, ‘Broughton House, Kirkcudbright: The Residence of Mr E.A.Hornel’, pp.260–3. 35. [This became the Hornel Trust, later passing to the Scottish National Trust. 36. From a transcript at Broughton House of Dorothy Burnie’s account of A Galloway Garden, 4 September 1925. This is a version of a paper delivered at a symposium on the theme of the Art of the Garden exhibition, held on 18 June 2004 at Tate Britain. I should like to offer my thanks to Joanna Banham, Head of Public Programmes at Tate Britain and to the curators of the exhibition Stephen Daniels, Nicholas Alfrey and Martin Postle. I should also like to thank Jim Allan, librarian of the Hornel Trust at Broughton House for his help in this research, and Bill Smith. Ysanne Holt is Senior Lecturer in Art History at the University of Northumbria and editor of the Manchester University Press journal Visual Culture in Britain. Ysanne Holt, ‘‘The Veriest Poem of Art in Nature’: E. A. Hornel’s Japanese Garden in the Scottish Borders’, in Tate Papers, no.2, Autumn 2004, https://www.tate.org.uk/research/publications/tate-papers/02/the-veriest-poem-of-art-in-nature-e-a-hornels-japanese-garden-in-the-scottish-borders, accessed 20 April 2019.